A gracious glimpse of yesteryear awaits those fortunate enough to visit the Poor Farm Bed & Breakfast. From 1857, the first year of James Buchanan's only term, until 1949, the first year of Harry Truman's second term, the Wabash Country Poor Farm served as the home for the homeless. Today. The Poor Farm Bed & Breakfast is home for the modern traveler who enjoys authentic country charm and genuine old-time hospitality. Enjoy luxury in one of the four room suites or gracious double rooms, all with private bath. Children are welcome! Located within walking distance of the historic Wabash River, two city parks, fishing, swimming, tennis, a driving range and perhaps the finest 18 hole municipal golf course in Illinois. This stately old 35 room brick structure will enchant you as you discover the simple joys of simpler times. Roam the 90 foot hallway and browse through the many artifacts, curl up with one of the hundreds of books, or enjoy an old-fashioned sing-along around the antique player piano. Within 45 mins you can experience nearby historic old New Harmony, Indiana or try your luck at riverboat gaming in Evansville, Indiana. Awaken to the aroma of freshly-brewed coffee and prepare yourself for a hearty Country Breakfast. 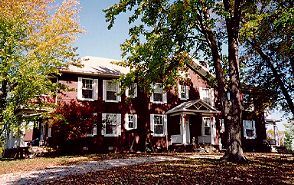 Whether vacationing, on a business trip or romantic weekend getaway, the ambiance, location and your hosts' sincere concern for your comfort will help you understand why The Poor Farm Bed & Breakfast is known as "The Inn place to stay"
This and other Mount Carmel Bed and Breakfast Inns can be found here in The Register.